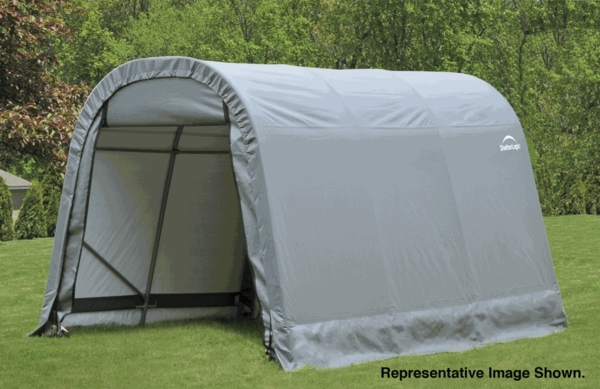 This Round Style Portable Shelter measures 8 feet wide by 12 feet long by 8 feet high. You can give your autos, tractors, trucks, farm machinery, yard equipment and other outdoor supplies the protection they need. Your temporary storage shelter features an all steel frame that has a baked on powder coating that will protect it from rust and corrosion. The top is rip stop, commercial quality polyethylene. The cover features protection from UV rays. Are the top and 2 side panels all one piece? How are the door panels attached to the top/side panels? How are the side panels secured down to keep wind from blowing under them? The top and sides are all one piece. The door panels attach using zippers. There are tie downs and ratchets that keep the side secure. What is the weight? Can you relatively easily move it around with two people? This unit weighs roughly 220 pounds. It is not meant to be moved easily from place to place. Thank you for your inquiry. What is the door opening height? The door opening is 7'5" tall. Is the gray colored cover more durable than the green one? They are both made from the same polyurethane fabric and will have the same durability. The entry door is 6'4" wide. Will this unit hold up to snow better than the barn style? The round style is indeed preferred over the barn style shelter as it will not be as susceptible to snow remaining on the top. However, if heavy snow is expected, you will need to be prepared to remove snow so that it does not damage the fabric. 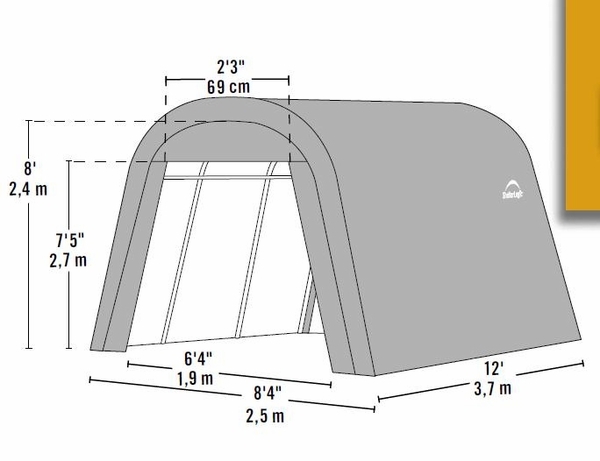 Does this ShelterLogic 8 x 12 x 8 round-style portable shelter have a front and rear cover that closes? Thank you for your inquiry. The ShelterLogic 8 x 12 x 8 Round-Style Portable Shelter does have two (2) double-zippered doors. This cover looks green -- is it green, or some greyish or other color? While the photo shown on the website shows the gray cover, the same unit is also offered with a forest green top as well. Does the ShelterLogic 8 x 12 x 8 Round-Style Portable Shelter open from both ends? Does it have something to close the ends? Are there any other products with this same footprint? This item has two two double-zippered doors. The ShelterLogic 8 x 12 x 8 Peak-Style Portable Shelter with Gray Cover has the same footprint. I am very satisfied with this shelter but I wish that I had ordered a larger one. This shelter seems very durable and stable and the whole process was easy from start to finish! I would highly recommend this shelter. ProsVery stable and durable construction.